Editor’s note: Kenneth Roth is executive director of Human Rights Watch. You can follow him on @KenRoth. The views expressed are his own. As rioting resumes in Egypt, militias reign ominously in parts of Libya, and relentless slaughter proceeds in Syria, some are beginning to question whether the Arab Spring was such a good idea after all. But would we really want to condemn entire nations to the likes of Mubarak, Gadhafi and al-Assad? As we know from the fall of military dictatorships in Latin America and the demise of the Soviet Union, building a rights-respecting democracy on a legacy of authoritarian rule is not easy. However, there are steps that both the people of the region and the international community can take to make a positive outcome more likely. The new governments in the Middle East and North Africa should remember foremost that an electoral majority does not grant them license to do whatever they want. Once they gain power, long-suppressed political movements may not be eager to hear that their latitude for governance is still constrained, but that is what international human rights law requires. Repression of basic rights can emerge as readily from majoritarian hubris as from a classic autocrat. Egypt, the largest and most influential country of the region, epitomizes the problem. The Muslim Brotherhood has used its electoral mandate to push through a new constitution filled with potential threats to the rights of women, government opponents, and religious minorities, while enshrining a dangerous autonomy for the military. The government has exploited these compromised provisions to launch a raft of prosecutions against journalists and others who criticize it, while old police habits of torture and lethal attacks on demonstrators persist. Between popular protests in Egypt and pressure from the international donors and investors needed to revive the Egyptian economy, there is reason to believe the government will moderate. But one would have hoped the Muslim Brotherhood, itself long persecuted by the Mubarak dictatorship, would have been more reluctant to replicate its predecessor’s repressive tactics. International protests would be more credible if they were more consistent and principled. The people of the region notice, for example, when the West’s promotion of democracy seems to stop where other interests arise – whether accessing oil, containing Iran or defending Israel. It is easier for the Egyptian government to deflect Western protests when so few are directed to the unreformed repression of Bahrain, Saudi Arabia, or the United Arab Emirates, let alone Israeli rights violations in Gaza and the West Bank. Nor do protests against torture resonate as powerfully when President Obama refuses to investigate torture by the Bush administration and the British government proceeds only reluctantly to examine its role in sending terrorism suspects to torture in Gadhafi’s Libya. The region’s most acute problem is the slaughter of civilians in Syria. The West has imposed sanctions on Bashar al-Assad’s government, but tougher measures, such as a global ban on sending arms to government forces or the invocation of the International Criminal Court, have been stymied by Russia’s veto, backed by China, in the U.N. Security Council. More should be done to highlight Putin’s callous indifference to the Syrian bloodshed and to ensure that the Russian arms supplier feeding Syria’s killing machine does not profit from Western purchases. In addition, the Arab League, ostensibly concerned about its brethren in Syria, should press its member Iraq to stop enabling the shipment of arms from Iran to Syria. But al-Assad is not the only problem. The armed Syrian opposition is a varied collection of militias, some of which torture and execute detainees while articulating a narrow sectarian vision that allows no room for Syria’s minorities. That makes the minorities more likely to defend al-Assad than risk an uncertain future in opposition hands. Fear of strengthening abusive or potentially hostile forces is also a major reason why Western governments have been reluctant to send arms or provide military backing. But the jihadists among the rebels have their own networks to obtain arms, enhancing the most abusive elements within the armed opposition. The Syrian National Coalition was created to provide a unified command structure for the opposition that could rein in abusive forces, guarantee minority rights, and pursue a negotiated departure for al-Assad and his henchmen that leaves intact enough of the state structure to avoid the chaos of post-Saddam Iraq. Yet the SNC’s clout is waning because it has little to offer the Syrian people to relieve their suffering. At the very least, a major influx of humanitarian aid is needed. But out of misguided deference to Syria’s sovereignty and overwrought concerns about taking sides in the conflict, most donors have sent aid via Damascus, meaning little gets to opposition-held areas where the suffering is most acute. Donors should also deliver massive quantities of humanitarian aid across the Turkish border and through the rudimentary civilian governance structures now being created in opposition-held areas of Syria. That would help to ease real suffering while enhancing the influence of both the West and the civilian governance structures in opposition areas that are most likely to promote respect for rights among opposition fighters and an inclusive vision of Syria for all Syrians. Ideally, such cross-border aid should be sent with U.N. Security Council approval, but if Russian intransigence precludes that, the international community should act anyway, operating as needed through non-governmental humanitarian groups. Yes, it has proven difficult to build rights-respecting democracies in the Middle East and North Africa. But the international community should not condemn the people of the region to the grim prospect of authoritarian rule without end, let alone to massive bloodshed. They have risked their lives for a freer future, and it is our responsibility to support them. As the Arab uprising enters its third year, we should all redouble our commitment to a positive outcome. How to keep the so-called "Arab Spring" blossoming. That's hardly possible since it has failed everywhere except for Egypt and Tunisia. Saudi Arabia, Bahrain and Yemen are still under the control of right-wing, pro-Western tyrants and that is unlikely to change anytime soon. No wonder many Arab political analysts don't use the term "Arab Spring". They call the movement "Arab Awakening". Spring is a season that lasts approx. three months. I agree with you. But there is more complications and intricacies to this. North americans are willing to destabilize just about any nation, and do so under any pretence or excuse they can use. The lattest has become the human rights issue. Yeah, well I am in utah, and here you see banners and lawn posters that afirm the homeowner to vote for the rights of animals, to stop animal abuse. Yet I know they are mormons and that as such, there is a 95% chance that they voted for bush, who ordered the slughter of millions of arabs, the destabilization of two sovereign nations and the maining and torture of countless children in secret concentration camps. And yet refuse to bring the emirates , arabia , and israel to acount. You lost all credibility when you chose your screen name. I agree with the meat of the article but please don't cite South American dictatorships when these were vehemently sponsored by the US (according to CIA docs). Historically, someone could argue that the US is not a sponsor for democracy but for their own interests. Well said, lalopangue. I'm sick and tired of people belching out all that bla-bla-bla about the U.S. being a "champion" of democracy around the world. The U.S. is in it for it's own self interests and nothing else. Yes, we did manage to establish some pseudo-democracies in places like Libya, Iraq and Afghanistan. The one we set up in South Vietnam finally collapsed in 1975 after some 20 years. 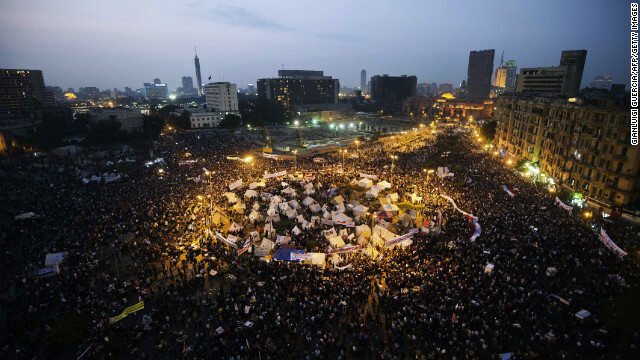 The idea that the west or anyone else could control the "Arab Spring" is false. No more than anyone could control the Russian, French or American revolutions. The Arab Spring has been produced by massive amounts of dissatisfaction with the world by ordinary people in the middle east. That does not mean that what follows it will be great for the people in the middle east. For once though this is a movement that has not been created by Nato or the Russians or anyone else (no doubt all these players are tying to influence it to their advantage though). The middle east is changing, slowly but it's one of the oldest and most socially conservative regions on earth and things take time. It took hundreds of years to develop the imperfect democracy that exists in the west. They are going to have to work out there own imperfect system. There is power in rejection. Take it from me. Then there is faith to make the power work for goodness sake. Only 'some' are beginning to question whether the Arab Spring was a good idea?! Are people really that far removed from reality that they can't see how disasterous it was and how pompous and ill-advised Obama's role in it was? First, Obama encourages Libya to overthrow Qadafi, helps out with a few airstrikes, then turns his back and acts like it never happened when the Muslim Brotherhood took over. Same story in Egypt. Syria's opposition faces a problem. The umbrella group, the National Coalition of Syrian Revolutionary and Opposition Forces is divided. Khatid, the head of the group wants sit together with Assad's officials to talk about the release of some 100.000 prisoners held in Syria and the renewal of passports of Syrian refugees in exil. There are some, who support Khatib. There are others, who do not settle for anything without Assad's stepping down. They call Khatib a traitor. Yes support the uprisings in a dozen arab countries while taking away the right to bear arms in our own country. What a two faced policy we promote !! Does anyone have an inkling on where I can purchase te earthen dish to cook a Tajin? Only language these arabs understand is oppression, that's it, their skewered religion and democracy don't go together. Their religion is based upon anti democratic values, period. The Arab spring is blossoming? You must be joking. What planet is this writer on? The only blossoms in sight are on the coffins of the hapless victims who have died at the hands of Islamists and Arab despots like Morsi in Egypt and Assad in Syria. The Muslim Brotherhood is a religious party that officially promotes Sharia law. Saudi and the gulf monarchies nurture and export Salifist jihadism and arms throughout the region, including to the Syrian rebels. Don't excuse them. Leon Panetta said we are at war with Al Qaeda. But we are also at war with all forms of Sunni fundamentalism and the governments that use it for political gain. Syria is sectarian civil war promoted by the Gulf states who hate Shiite Iran, and who also despise the Shiite-led government of Iraq. Get your facts straight before attempting to solve the problem. I love the part where Roth slips in a jab on Obama and Bush by chastising the former for not investigating the latter for using "torture" techniques. The very same torture techniques that led, in large part, to Osama Bin Laden's courier and then to Osama himself. Obama didn't close Gitmo and didn't repeal the Patriot Act either. Many of Bush's core post 911 policies are alive and well. Could it be that there are some very practical / pragmatic reasons that liberal idealism simply falls apart in the face of daily national security briefings? I know it hurts the left's sensibilities, but one of the most admirable traits of President Obama is precisely his refusal to allow the far left agenda hijack his primary responsibility to protect the U.S. - even when that mean compromising on ideals that are noble in of themselves but foolish and weak in the face of the scourge and threat of terrorism. India & Pakistan needs one and Saudi too. I hate this expression 'Arab Spring" it drives me crazy, and who believes that, deceives him self. Arab Spring started out as a the youth movement for a more liberal middle east. Now it's just an excuse for wahabi fanatics to rave on the streets like the crazy lunatics that they are. It failed miserably as was expected. Nothing to see here. Carry on. stop playing around. this is not tetris. Obviousely this Fareed Zakaria is just an incredibly naive man. He needs to go plant himself in the Arab spring. You forgot to remember that these dogs o' war let unlashed by some idiotic personage led to this unintelligent rush. Remember the French Revolution. And the Guilotinne. It may look romantic or Noble to you. But this is not a movie or a box game you can bet on. People die. The so called Arab Spring should not be on the battling ground and between pions of some enthusiastic party. But in somewhat social level. By talking, exchanging historical facts and sharing and respecting each other's culture.